hi - I'm helping a friends family settle his estate. He has a restored Evan's power cycle that is beautiful. I need help with assigning a value. What is it worth? Thanks in advance. I will try to post a picture later this week. If you send me a few pictures I could help you establish a reasonable value. I own a few and have a far amount of related literature. I too might be interested in buying it myself. Ive attempted to clean it up and coat it with a fuel proof epoxy with not such good results.My second option was to make a float out of brass,keeping it's weight and bouyancy the same as the cork but I'm still having a hell of a time getting it running.Ive gone through all the steps to set up the timing and spark for I have original literature to guide me through the process,but still,no go. It does kick,,smoke and act as if it wants to get up n run but just wont keep running. I wonder if anyone here might hava a few suggestions,parts perhaps?,,maybe a float?,any sort of shop manual if there ever was one?,maybe even specs on the float itself? Also,I wonder if there is a site of some sort or a registry that pertains to these bikes specifically? 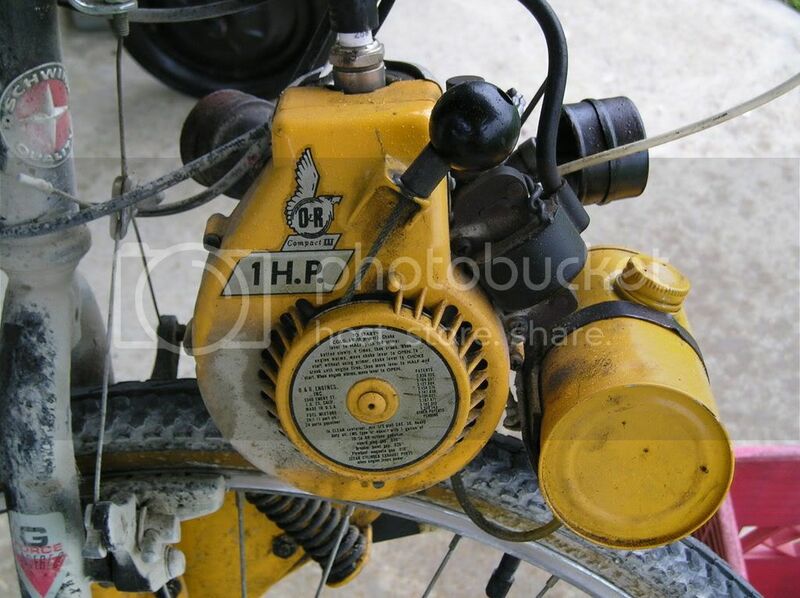 RARE Orline/Ohlsson & Rice/Chicken Power motorized bike engine for sale. Running good & a blast to ride.N. Florida location. Will sell engine kit alone, or mounted on a good donor bike. Gets 125mpg. Motor kit=$195 or on a bike $225. Price reduced= $145 for the complete kit, or $175 for kit mounted on the bike ! That message was a little off-topic. BTW, MotoredBikes.com is a much larger source of information than motorbicycling.com. I have a limited special edition Western Flyer made by Columbia Mfg., along with the certificate of authenticity and owner's manual and was wondering what it would be worth. Any ideas!!! Not sure of value but interested if selling. I also have this bike. Did you ever find out the value?